Knowledge is an acquaintance with facts, and the greatest and most fundamental fact is Yahweh our Father and Mother of creation, Her existence, Her invincible purpose and power, and Her Way. Our Creator knows our hearts. Every thought is read by the Almighty God. If you really love the Truth and look for it like precious gold or silver, you will find it – that is a promise from the Most High God. The Word / The Holy Bible is also called the Great Jigsaw Puzzle because it is written to confuse those not true of heart. If you are not sincere, why should your Creator give you understanding of Her Way? Our Creator is the Father and Mother of all creation. The Most High God is ONE and complete within Himself/Herself. Genesis 1:27-29 So God created man in His own image; He created him in the image of God; He created them male and female. So, why is Father not referred to as “Mother” in place of Father in the many mentions of Yahweh in Her Word? Because Yahweh is also the representative headship of all of Her creative works, just like Man is headship above the Woman, it follows the same ladder of identification (attribute wise) in Yahweh’s make-up; yet, Yahweh is all things to all of Her creation – possessing all attributes that we came forth into existence and are endowed with. Everyone has both male and female attributes – that is basic biology – both male and female hormones are present in each person. Do you possess both male and female attributes? Father Yahweh represents our Creator’s male and the warrior side. Exodus 15:3 The LORD is a warrior; Yahweh is His name. To be male is to be One that must be stricter and harsher on Her children for breaking law. This world is destined for destruction by Yahweh. Look around you, how many of us give glory to the Only One who is worthy? Isaiah 42:8 I am Yahweh, that is My name; I will not give My glory to another, or my praise to idols. Isaiah 30:27 Look, Yahweh comes from far away, His anger burning and heavy with smoke. His lips are full of fury, and His tongue is like a consuming fire. Israel Mother represents our Creator female side. Her presence at Mount Zion is that of a BEAUTIFUL and MAJESTIC FEMALE. ” “I AM” = ISRAEL ALPHA MOTHER. It was encoded to Moses, due to come out in the time of the end. “Yahweh” in name was later revealed to show the warrior side of our Mother. Moses did not know at that time that Mother was giving a question and a puzzle piece. Isn’t the Word intricate? And all ties together for those that have learned the TRUTH. You never stop learning from the Word (even holy angels who have been in existence for six million years and counting are still actively learning). Most of you know that the underlying reason Dawn Lucifer became Satan was because of his desire to be a god. But have you ever thought about why a clever angel like Dawn would dare to challenge the Almighty God? At the time of Dawn Lucifer’s rebellion, he had never seen the warrior side of his Creator and thought that the Most High God was a weak female. And this is why Yahweh says: Exodus 9:16 “However, I have let you live for this purpose: to show you My power and to make My name known in all the earth.” This message was dual, and it was also meant for Her archenemy, because Pharaoh represented Satan in Father’s eyes. Father wants to show Satan just how powerful She is. He underestimated Her. Her kindness he abused. What about the nation of Israel? This is Satan’s world. The one Yahweh promises is NOT that of the people that took Her personal female name for a short span of time and failed Her by rejecting the Savior She sent. Though there are some fleshly Israelites that believe in Christ Jesus, the vast majority are now made up of the Spiritual Class of Israelites; Ancient Israel only typified what was to come – those of Spiritual Israel. The promises are for Spiritual Israel, which is comprised of all those who seek Yahweh and Christ with a humble heart. YAHWEH MAKES NO EXCEPTIONS FOR ANY NATION PRESENTLY ON THIS PLANET. ALL ARE UNDER HIS DECLARATION TO BE SERVED THE WRATH OF THE JUDGMENT. 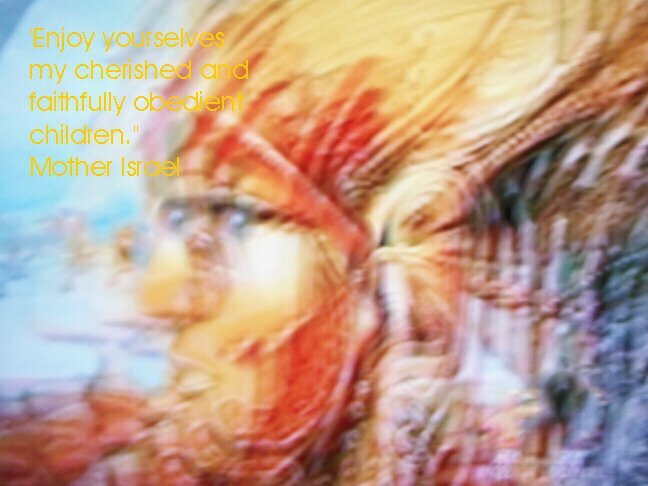 We all descended from what was typified if we have faith in Christ and Yahweh; they were our examples of olden times – laying out the pattern, making mistakes, and often setting examples of faith for us to learn from, and revealing Yahweh’s Plan to take all obedient subjects into the Promised Land of Christ’s Millennium. Later in the Gospels about Christ you learn that if you have seen Christ you have also seen his Father. Literally so because Christ represents Yahweh in every detail of male attributes. John 1:18 No one has ever seen God. The One and Only Son — the One who is at the Father’s side — He has revealed Him. Now, Yahweh mirrors one thing off of another, and so Israel – the ancient people She gave birth to reflect Her Son Michael whom She designates as Her “firstborn son,” as a revelation that She then reflected Her Motherhood upon that nation by giving them Her female name and taking them as a wife unto Her male counterpart of being Yahweh. Done so, because at that time She was guiding them in the male attribute of being Yahweh the Father and Warrior. By entwining Her female name within the Word and attaching it to Her remnant of Israel, She encrypted that secret for revealing in this end time we are all living within. As a precursor, Israel had Michael created Adam first – being a man to reflect Michael, and then in a reverse process of Israel and Michael, i.e. female first and then male, She reversed the process with humankind’s start in creation with Eve reflecting our Mother Israel as the Mother of all humankind. Yet, Israel the Mother is the Mother of the START of all things in creation. Michael was Her START, or only creation. From Michael all of the invisible and visible creation came forth. Like Adam who all humanity came forth from including Eve’s existence, Michael is who every creation spawned forth from. So, Eve typified Mother, but because Michael was the bi-creator of his own ability to form and fashion what exists, Mother Israel gave him prominence by allowing Adam to be created first, and then Eve was taken from Adam just like Michael came forth from Israel our Mother. Out of Her literal BODY. That is the secret now revealed in these end times. It explains why Mother chose that name for Her chosen people and why they were for Her Great Name’s Sake. Satan defiled Israel’s Great Name in the Sacred Garden of Eden, and Israel acted in the male attribute by becoming Her Warrior Self – Yahweh to defend Her Name and gain back Her reputably standing before the heavenly family and the Gods of Eternity that are onlookers. Yahweh is not only a King Herself, but a Queen of all that exists, with the BEAUTY to go with it. Yahweh is a Warrior Father, and a Loving Mother. The choice is yours: All of you have come in contact with religious people that claim to understand the Word, but quite differently from what you have come to understand. Why so? The words they’ve all read and studied is the same words you’ve all read and studied. Yet their understanding is quite different than what we share here. So you see, to gain true understanding one must then gain wisdom from the One that originally gave the supernatural knowledge. Do you believe your Creator can guide you or do you prefer to listen to men or your own inclinations? Ezekiel 13:3 This is what the Lord GOD says: Woe to the foolish prophets who follow their own spirit and have seen nothing. Isaiah 5:21 Woe to those who are wise in their own opinion and clever in their own sight. Our Savior and King Christ Jesus is calling all those who has listened to and learned from Mother Yahweh to come to Him and join Him in His Millennial Kingdom. John 6:45-47 And they will all be taught by God. Everyone who has listened to and learned from the Father comes to Me—not that anyone has seen the Father except the One who is from God. He has seen the Father. This entry was posted in Yahweh and tagged Creator, Father, God, Israel, Mother, Yahweh. Bookmark the permalink.